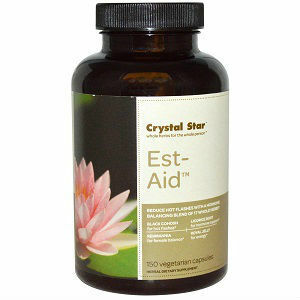 Crystal Star-Est-Aid is an herbal formula marketed to those with an estrogen-progesterone imbalance. Crystal Star-Est-Aid is indicated to provide relief from hot flashes and other symptoms for women approaching a natural menopause. It is also indicated as beneficent for moodiness, memory lapse and body thickening. Rehmannia – Rehmannia is used to provide restoration of the feminine balance. Royal Jelly – Royal Jelly is used to provide energy. 2 capsules thrice daily for the first two months is the initial recommended dosage of Crystal Star-Est-Aid. After the first two months, 2 capsules are taken twice daily, in the morning and evening for another 2 months. A 1 month break is recommended after four months, or switching to another product manufactured by the same company, Easy Change. A bottle of 90 capsules of Crystal Star-Est-Aid costs $29.95. The only guarantee provided with Crystal Star-Est-Aid is of the state of the product itself. They will accept returns for any products defective due to manufacturing problems up to 30 days after purchase. There is no refund if the product does not work for you. Crystal Star-Est-Aid is a good product, however when it comes to the natural approaching of menopause, women wanting to balance out their estrogen to progesterone ratio will want something better. Jackie Horowitz	reviewed Crystal Star Est-Aid	on August 25th	 and gave it a rating of 2.5.